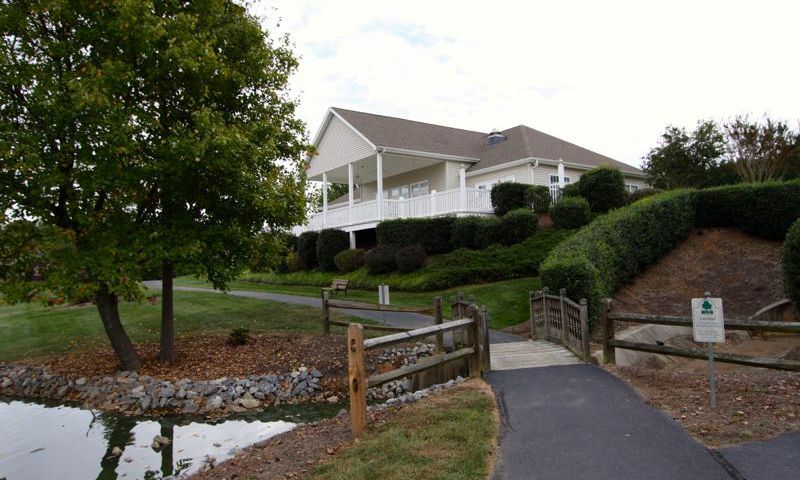 The Villages at Oak Tree is a 55+ community situated in Mooresville, North Carolina. This intimate community offers a bustling lifestyle and amenities that keeps homeowners both physically and socially active. With low-maintenance homes, many activities, and friendly neighbors it’s easy to see why active adults are eager to call The Villages at Oak Tree home. The hub of activity throughout The Villages at Oak Tree is located at the community clubhouse. Here residents have a wide variety of amenities to keep residents engaged. For the fitness-minded, there is an exercise room equipped with cardio and strength-training machines. For the socially minded, the multi-purpose room is perfect for small club meetings or larger parties. The Villages at Oak Tree’s clubhouse also has a library and catering kitchen. Outdoors, residents can jog or walk on the trail that surrounds the community’s picturesque pond and landscaped sidewalks. The Villages at Oak Tree even has a fenced-in lot to store your boat or RV. Built between 1999 and 2004 The Villages at Oak Tree is made up of 173 low-maintenance residences that include attached townhomes and single-family homes. All of the residences throughout The Villages at Oak Tree have approximately 1,100 to 1,500 square feet of living space with two bedrooms, two bathrooms, and an attached garage. Every home was designed for active adults with single-level floor plans and large master suites. Homeowners throughout The Villages at Oak Tree enjoy low-maintenance homes and do not have to worry about yard chores. This leaves more time for residents to join one of the many activities or events that is scheduled by the community’s activities director. The Villages at Oak Tree’s clubhouse has a small dance floor with plenty of seating to host fun community events. The Villages at Oak Tree is located in Mooresville, North Carolina. Homeowners are located near many shopping, entertainment, and dining opportunities throughout downtown Mooresville. The community is also just 30 minutes from Charlotte, offering both big city and small town attractions. The Villages at Oak Tree’s close proximity to Lake Norman allows its residents to live a resort lifestyle with 520 miles of shoreline. The area offers a mild, yet four-season climate that makes Lake Norman home to numerous attractions. Lake Norman is packed with all sorts of events and things to do in Cornelius, Davidson, Huntersville, and the surrounding areas. Whether you want to fish for bass, shop at unique stores, or attend cultural events living in The Villages at Oak Tree offers a myriad of options to stay active throughout the Central North Carolina. Check back soon for more information on the lifestyle in The Villages at Oak Tree. The Villages at Oak Tree's twin townhomes are single-level, low-maintenance residences that offer up to approximately 1,500 square feet of living space. Each home has at least two bedrooms, two bathrooms, and an attached garage. These homes feature trey ceilings in the dining, living, and master suites. Please Note: Floor plans are not available at this time. The single-family homes throughout The Villages at Oak Tree are stand alone units that offer up to 1,500 square feet of living space. These homes offer at least two bedrooms, two bathrooms, and an attached garage. Homeowners enjoy private yards tucked away from the rest of the community. Please Note: Floor plans are not available at this time. My Mother has been there a couple years. She's made a lot of friends and does a lot of activities with neighbors. My Mother told me that it was the best decision to sell her home and buy in this community. My husband and I feel very comfortable with her safety. I highly recommend this community. Great prices and a good location near Lake Norman. I love to fish so I spend a lot of time at the lake. The house needed some updates but it was well-built. The clubhouse could use some updates too but I don't really spend much time there. 55places.com is not affiliated with the developer(s) or homeowners association of The Villages at Oak Tree. The information you submit is distributed to a 55places.com Partner Agent, who is a licensed real estate agent. The information regarding The Villages at Oak Tree has not been verified or approved by the developer or homeowners association. Please verify all information prior to purchasing. 55places.com is not responsible for any errors regarding the information displayed on this website.